I love all fruit, but peaches are my favorite. (If I were a fruit, I'd be a peach!) I usually make Peach Pie with Lattice Crust, sometimes Peach Cobbler or Peach Galette. This time I decided to go with pastry rounds instead of lattice for the top crust. And since this is the month I've chosen to go gluten-free, I used my special recipe for an excellent gluten-free crust. If you've never made a peach pie without peeling the peaches, give it a try. Just rub all the fuzz off while you're washing and drying them. Once the pie is baked, I promise you, you won't even notice -- other than the fact that the crimson blush of the peach skin makes your pie even more beautiful. What fruit will you miss most when summer is over? 1 With metal blade in place, add sorghum flour, potato starch, tapioca flour, xanthan gum, salt and baking powder to work bowl of food processor. Turn on for three seconds to combine. Add half the frozen butter and process for 10 seconds or until mixture has the consistency of coarse meal. Add remaining butter and pulse for six 1-second pulses, or until the frozen butter is the size of small peas. Note: Cuisinart DLC-10S Pro Classic 7-Cup food processor is a convenient size. 2 In 2/3-cup measure, combine lemon juice or vinegar and ice water. Pour over all of flour mixture; pulse for six 1-second pulses or just until dough forms large clumps; do not over-process. 3 Turn dough out onto lightly floured (gluten-free, of course) surface--a piece of plastic wrap or parchment paper makes it easier. Divide dough, 2/3 for bottom crust and 1/3 for top crust. Do not refrigerate dough at this point as you would do with regular all-butter pie crust; but if it's a really hot day, you can wrap it and refrigerate it for 5 or 10 minutes or so. 4 Form the larger piece of dough into a round disk, sprinkle lightly with gluten-free flour--topping it with another piece of plastic wrap or parchment paper makes it easier--and roll out to 12- to 13-inch circle. Transfer to Pyrex 9-inch pie plate that has been sprayed with cooking spray. Crimp the edge in your favorite way, then pop the pie plate into the freezer. 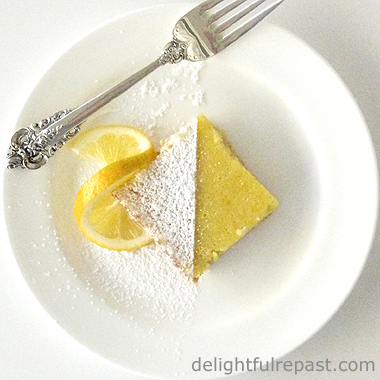 On a piece of parchment, roll out the smaller piece of dough to a 9-inch square. With 2-inch round cookie cutter, cut out 16 pastry rounds. Cover and place in refrigerator while preparing pie filling. 5 Preheat oven to 425 degrees. On lightly floured surface, roll out dough to a 13-inch circle about 1/8 inch thick. Line 9-inch glass pie plate with pastry, trimming overhang to about 3/4 inch. Place in refrigerator. 6 Peel peaches only if you must--do try NOT peeling them--and slice into a large bowl (I use a 2-quart glass measure). You'll have about 6 cups of sliced peaches. (I slice them like this: Quarter peach, cut each quarter into 4 wedges, cut wedges in half.) In a small bowl, whisk together sugar, tapioca flour (take it from me, THE best thickener), salt and spices; add to peaches and mix gently but well. Pour into pie shell. 7 Working from outer edge, place 10 2-inch pastry rounds. Use 5 pastry rounds for next circle, and place one in the center. 8 Place a foil-lined rimmed baking sheet in the middle of the oven to catch any drips, and place the pie on the baking sheet. Bake at 425 degrees for 30 minutes. Lower temperature to 350, and bake for an additional 35 minutes (juices should be bubbling). Cool on wire rack for at least 3 hours before serving. Peaches are good; strawberries are my personal favorite. Mmm ... I love strawberries too! A dream come true! 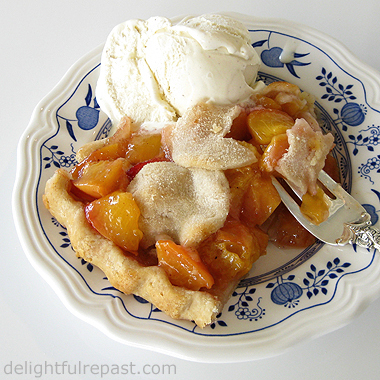 How I love peach pie, and can hardly believe that it can be delicious when gluten free. I am definitely trying this when our peaches come to the farmer's market later in the summer. Thanks, Jean. Have a wonderful Fourth. Judy, thank you! I did think of you when I posted this. Do let me know how it turns out for you. Even for non-gluten-free pies, I will never use anything but tapioca flour for a thickener for fruit pie fillings. It is the best - and to think, I only got the idea to try it because it was still sitting on the counter from the pie crust! My husband LOVES peaches! This is a perfect birthday pie for him. Thanks, Angie! My friend's daughter would agree with 'birthday pie' instead of birthday cake; in fact, she had wedding pies instead of wedding cake! Ah. Thanks to your blog post, I’ve detected the flaw in my recipe. I.e., you take the pits out of the peaches before you put them in the pie! Thank you very much. Skins work for me. Fruit pies are always appealing to me, but I seldom eat them. Must rectify that. Guess my favorite would be a good blueberry specimen with lots of glurpy syrup that wouldn’t make the cut in your recipe stash. Do like apple and rhubarb or cherry if they are anchored in enough aforementioned glurp. And I used to make a black cherry pie to die for… But after several people did – die, that is – I deferred to the American Diabetes Association and hung up my apron. Well, Sully, I do like a certain amount of the "aforementioned glurp" in a fruit pie. But I'm very particular about my glurp. Not an excessive amount of sugar and just the right amount of thickener - no solid glurp for me! There is such a need for this - glutten free is on the rise! What a beautiful blog you have. I am delighted you stopped by mine. Thank you! 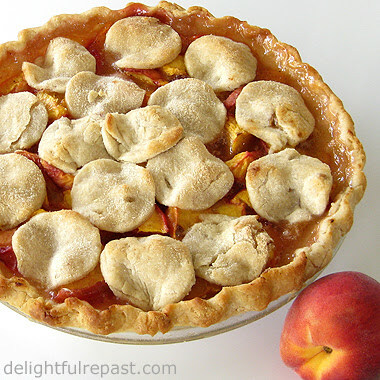 Not only is your post on peach pie mouth watering, I am mesmerized by your photography. Is it too much to ask what general settings you use? Do you use a DSLR? I have huge photography learning curve to overcome. I think you're right, Bernideen! Seems like the percentage of people with celiac disease, gluten sensitivity, etc, is going up all the time. Laura, thank you so much! I try to do the best I can with my little camera - I definitely need to upgrade to a proper camera. Of course, then I'll have to learn how to use it! Thank you, Laura! Peaches ARE the best! And thanks for the pin - I've only just started with Pinterest, haven't quite sorted it out yet. Peach pie has always been one of my favorites. Gosh, I love you blob but it makes me so hungry! Lana, thank you! And ... LOL ... I've been making the same typo today (and more). I think my fingernails are getting in the way; they grow like weeds! I will miss watermelon the most when summer is over! I think you're right, Zahra - there's nothing more refreshing on a hot summer day than cold, crisp watermelon! Hotly Spiced, thank you! That opposite-seasons thing would take me a while to get used to if I switched hemispheres! Jenn, I know what you mean. (I don't understand it, but I know what you mean!) My husband never liked peaches much, but he likes my peach pie. A delightful peach in real life? Aw, thanks, Grant! :D About Sully's diet - I can only hope the coffee blast ice cream is organic!